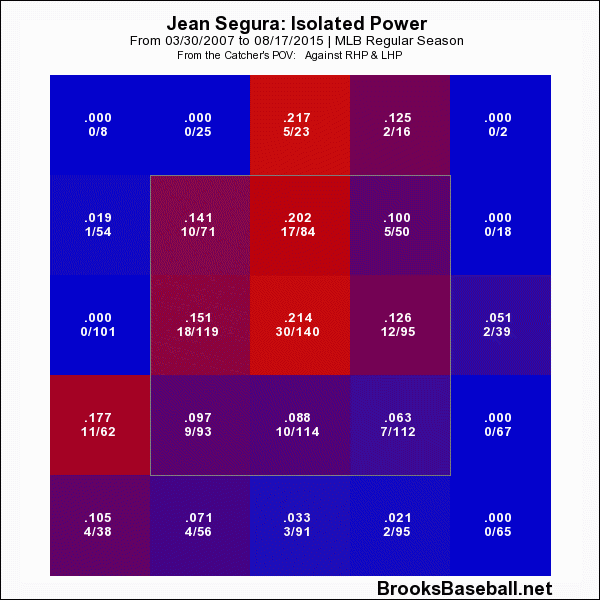 Back in July, when Jean Segura looked to have bounced back from a rough offensive stretch, my colleague Derek Harvey covered his season to that point. 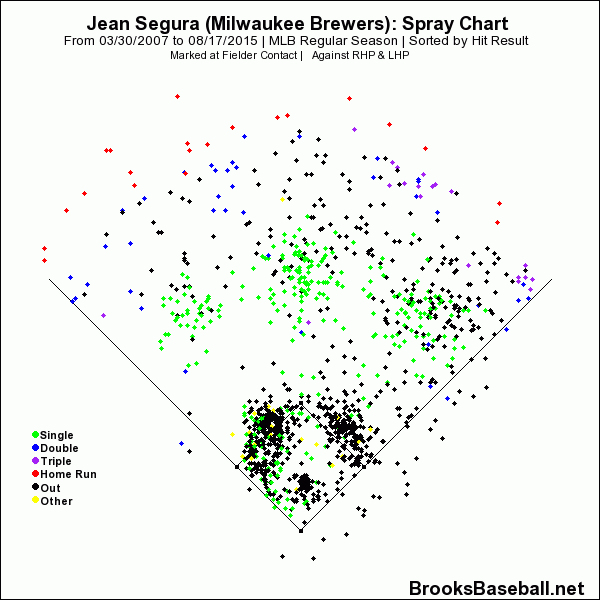 Since we published that piece, Segura has completely melted down, batting a mere .174/.193/.186. Obviously, numerous factors have caused such a decline — including a paltry .211 BABIP — but one of them extends back a little bit further and should probably concern the team to a greater extent. Aside from helping the Brewers top the Twins, that long ball upped Segura’s 2015 ISO to a respectable .130. That number would presumably regress a bit as the plate appearances piled up — before the season, even PECOTA’s 90th-percentile projection predicted a .120 mark — but it’s still seen an incredible drop. In his 248 trips to the dish, from June 7th until Sunday, Segura has accrued two extra-base hits (a double on August 13th and a home run on July 21st). The resulting .017 ISO simply won’t suffice for a major-league player, no matter how productive he is defensively. What could have set in motion such a tremendous drought? While Segura did go on the disabled list in mid-May after fracturing his pinky, that didn’t seem to deter him during his first several games back. From May 29th to the aforementioned outing on June 5th, he swatted two doubles, a triple, and that round-tripper. He has made worse contact in his dry spell (per FanGraphs, his hard-hit rate before June 6th of 27.4 percent has dropped exactly half to 13.7 percent) and he said at the time that he wanted to play through it, so perhaps it’s played some role. Most hitters will post worse power numbers when poking the ball into the opposite field. 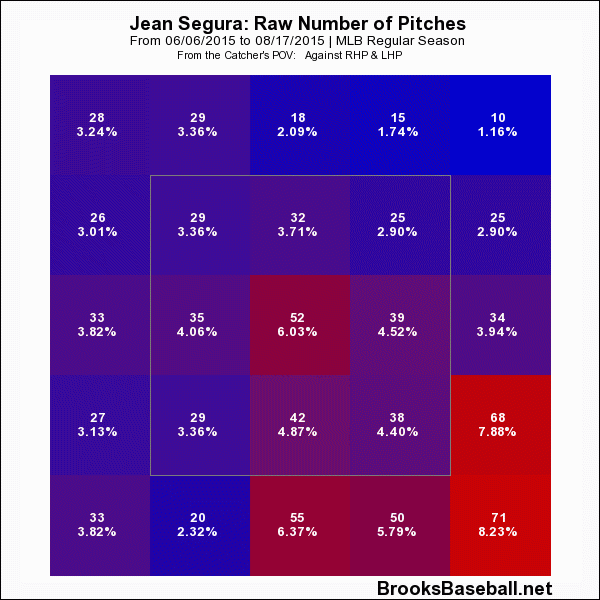 However, after defying that trend for a few seasons, Segura’s come down to earth. 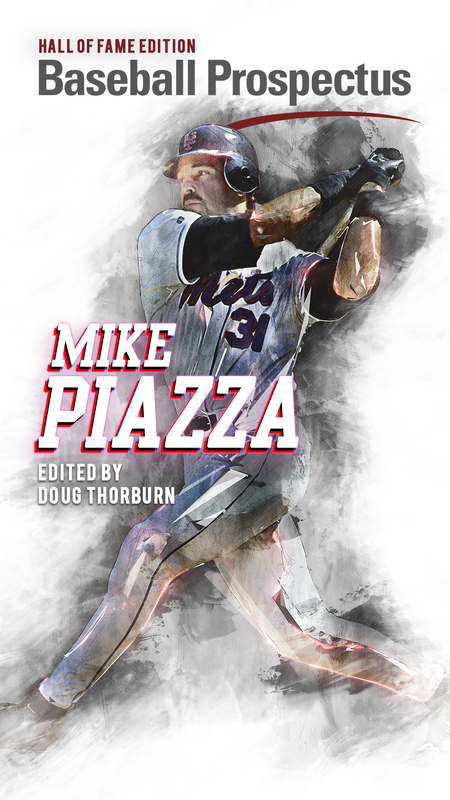 Add that together with his drop in pull rate — he’s gone with the pitch 19.5 percent of the time during his cold streak, as opposed to 28.2 percent prior — and you get, well, this. Our own Derek Harvey rightly observed in his article that Segura has struggled to counter-adjust when hurlers changed their strategy against him. That would certainly appear to hold true in this case, where Segura’s done nothing with what the league has given him. It’s a league of adjustments, and the 25-year-old has to be able to adjust yet again. 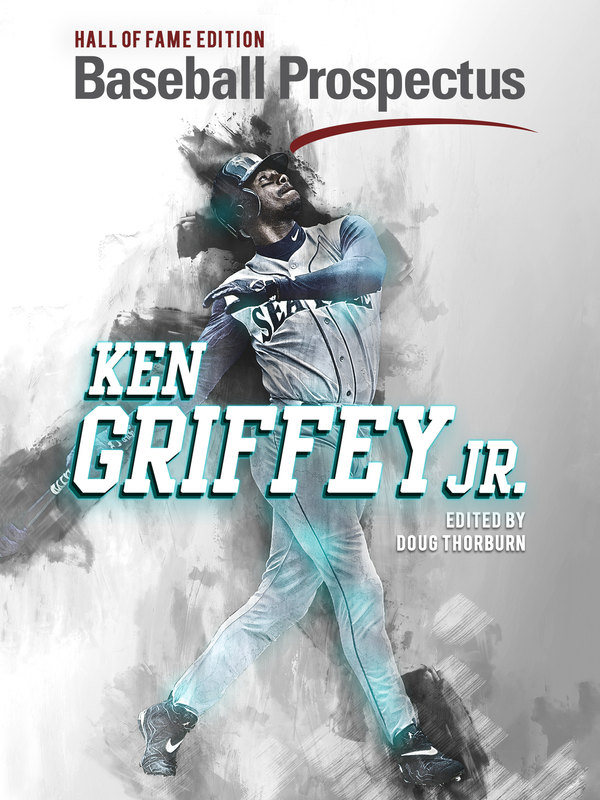 Back in 2013, Segura cranked out a solid .126 ISO, legging out a healthy amount of doubles and triples to compensate for his lack of home-run power. Those extra-base hits vanished in 2014, and after seemingly returning in 2015, they’ve evaporated once more. Segura clearly has a true-talent-level higher than this, but if he doesn’t play up to it, the Brewers may have to look to their minor-league system for a new shortstop.